The Payback 2 card looks full. 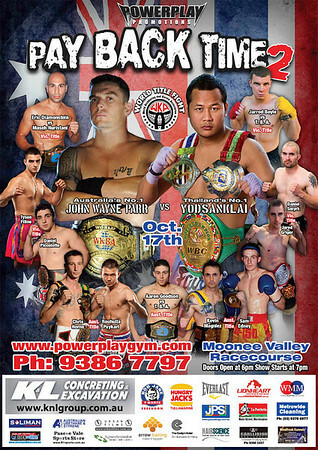 For those of you that are not certain what the the theme is in the Payback series of cards it centers around John Wayne Parr. Basically Parr gets a chance to avenge his losses against former opponents. The first opponent Parr rematched was Mike Zambidis whom he initially lost to in a K-1 MAX Oceania qualifier years ago. This time around Parr will get a 3rd match against Yodsaenklai Fairtex who after his stadium title runs went on to fight and beat pretty much everyone internationally outside of some close battles with decision losses or draws (most of which to me were questionable). Parr has been dealt 2 losses in total from Yodsaenklai and I guess the thought is maybe the 3rd try will be the charm. Some speculation has been that Yodsaenklai has looked in less than stellar shape lately and Parr could possibly leverage that into a win. However I’ve never not seen Yodsaenklai not in shape for a fight. And honestly there is in my opinion little precedent for a 3rd match since to my eyes they weren’t remotely close fights with Yodsaenklai dominating both prior bouts in what has become typical fashion for the world champion. Parr has become a fixture of Australian Muay Thai so much so that I wonder if there will be any big events in Australia without him. One way or the other Parr has left a legacy in international Muay Thai that is nearly peerless. To promote the fight a clip has been released. ~ by fatsoking on August 18, 2010.
i cant stand the hype around parr and his fighting style…. i bet hes gonna do those rushing straight punch combos allday again. like that will work against a technician like yod..
watch the youtube promotion clip and look at JWP’s amateur-like straight punch combos. it makes me sick watching it. TOTALLY agree. And on another note: He’s been fighting the exact same way for YEARS – no developments, no changing his stance, his choice of weapons utilized etc. etc. etc. VERY boring to watch. If he had a manager and I was the one I would tell him to hang it up and focus on his gym and family!